I was meant to update on Friday night but I was just too tired as we left the house at 9am and got home just before 9pm. It was a very busy day! Me, Pete, Mum and Ryan were then shown around the building, there was a a few offices and things, a waiting room and then the treatment room. Which was very open and had reclining chairs around it with the people having their chemotherapy. It was a very laid back environment which is great, cos I'm pretty laid back. They look rather comfortable! I'm allowed to take my laptop in and some DVD's and stuff which is cool. I've got enough DVD's to choose from!! 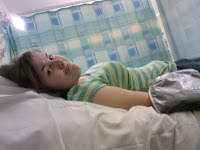 After that we left and headed off to Colchester Hospital to get my PICC Line fitted. Felt like we were waiting for ages and then eventually got called in, this nice man called Chris (Hi Chris!!) numbed my arms and confirmed that my veins really are rubbish! I don't know why though. Hmm...Anyway, I went off for about 3/4 of an hour and my arm came up in a rash so he took the plaster off and wiped away the cream and then I layed on the bed with these heat pads on my arms. It felt like they took forever to get prepped, I wasn't nervous - just wasn't looking forward to it! My Mum was taking pictures the whole way through (they didn't turn out great though) and Chris put the cannula in and it hurt quite a bit but you know...I'm a toughie lol. I handle pain quite well (usually!) - then he started threading the line through and I didn't really feel it. What hurts more is when they take the plaster off and it pulls out all my arm hairs!! I could cry lol. I'm dreading tomorrow cos they'll be taking the dressing off, haha. After that he bandaged me all up and I went off for a chest X Ray to see if it was in the right position. Thank God it was!! 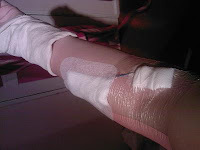 Went back, had it properly bandaged up and then left the Hospital. I thought it would only take 2 1/2 hours at this Hospital but it ended up taking 5 lol. So tomorrow is the big day. I'm not actually feeling nervous or anything...if I'm sick, I'm sick. I'll get better!! It feels like it's my first day at School cos I'll be the 'new girl' lol. I am sure I'll be okay - it's kind of scary how much this cancer has changed my life already, I'm not letting it take over any more of it. Cancer is NOT in control of me, I'M in control of it and I'll kick it's arse. I'll update sometime this week. P.S I forgot to say that the tumour is T4 which is basically the grading of it, I think this is the worst one. It means that it's spread to somewhere else other that the larynx and they think it might of spread to two lympth glands BUT they said that the chemo and radiotherapy WILL get rid of it. They never actually told me which grade it is, I saw it wrote down in my 'chemotherapy diary' - it has annoyed me that they never actually told me this. When I went to London I was told either grade 3 or grade 4. I feel they should of told me which one it definitely was. Oh well. Good luck for tomorrow hayley - you deffinatly ARE IN CONTROL and you will beat this!! good luck. illbe thinking of you!! Good Luck tomorrow Hayley. Be strong. I'll be thinking of you. You go girl, tomorrow marks the start of your journey towards being cancer free again - It's great it's all started so quickly because it means you are already able to start counting down the days until all the treatment is done with! I don't care if you don't agree, daughter of mine..lol..you are brave and dealt fantastically with having the PICC line put in! So very proud of the way you are in dealing with all this. Hey Hayley, so you have taken your first step towards beating this Cancer's arse.... God willing you will totally Beat it, Just keep up your Positive attitude and Don't ever lose hope, You are so right that You are in Control of Your life and you will Be cured of this. I really hope and pray that you dun get any sever side effects, Do take good care. p.s: can't wait to see your pics bet your are looking real good in them. Your positive attitude is great, keep it up even though it must be hard. I think it is a great idea to keep a blog about this as at least you have somewhere to talk about it. Losing the hair thing - can I just say my Dad never lost a single hair on his head, but he lost all body hair - weird I know. I bet your photos come out great. Cheryl is brilliant, I knew it would be her that offered her services, I can't wait to see them. Good luck with your treatment, keep your chin up. you are an inspriation to me!! First of all can I offer my support and compliment your strength. I am the Witham reporter on the Braintree and Witham Times and I read with interest the feature on you in yesterdays Essex Chronicle. I was wondering whether I might be able to speak with you or your mum and do a similar piece? Everybody knows somebody who either has or has had cancer and your positive attitude, at your age, would be particularly inspirational to our readers. I am in the office tomorrow and Sunday morning if this is of interest to you. Just a note to let you all know that when Hayley is feeling 'up to it' she will be updating this blog. At the moment she is very tired from the chemotherapy - which is one of the side effects. heya, i saw you in the chronicle! famouse now! lol! cant wait to see them pics. hope everything goes ok with your chemo! will be thinking of you! hi hayley its amy w from school i just heard about your cancer. you have such positive attitude. i have no idea what your going through but i know you will beat this because your such a strong and positive person that you will be able to fight anythings. 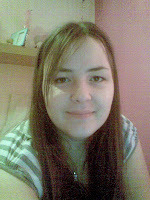 I read your blog with pride, even though I've never met you Hayley. You have such a wonderful outlook on life. Your parents and family must be so proud of you, I know I would be if I were your mum. I'll be back to catch up on your progress. Have a Happy New Year and a healthy 2008.
hey hayley sweets, hope ur feeling better now, u know you are always in my prayers and thoughts, God willing your positive attitude and strong will, will help you beat this cancer completely. your dad is so very proud of you, we are always here for you. A very Happy new year to you, Hope this year will bring you health and happiness. You make me laugh cos you keep saying "this nice person" but I know you, you are probably thinking how you hate them all. You hate everyone lmao. I don't really have much to say about this one, cos I can't say good luck cos it's been. I wish you could talk properly then you could always tell me when you've updated.